This entry is part 7 of 9 in the series CheeseWeb's Asian Adventure 2013. Hong Kong is truly a cultural melting pot, where East meets West, and nowhere is this more evident than the food culture. Like Brussels, Hong Kong restaurants cover just about every flavour of the globe, and it was our mission to sample as many as possible. Arriving at our hotel early in the day, from Kota Kinabalu, Malaysia, we unpacked our things and set out to look for lunch. I was hoping to ease myself into the Hong Kong dining scene, but Andrew had his heart (or, more accurately, his stomach) set on one thing – roast pork. Luckily for him, the street behind our hotel was lined with tiny restaurants displaying a variety of roasted meats, hanging in their windows. There was plenty of pork, duck, goose and the occasional unidentifiable mystery meat. We chose a restaurant at random and snagged a plastic table; one of only about six in the small space. Sun Yeun’s menu was in Chinese and English, so when our waitress arrived, an elderly lady we took to be the owner’s wife, we were able to point at what we wanted: roast pork for Andrew, roast duck for me. There was a bit of frenzied knife work, from the open kitchen, and within minutes mountains of meat served on fluffy white rice appeared before us. Both the pork and duck were juicy and tender with crispy skin – exactly what we had been dreaming of. While we ate, the owner took delivery of another whole roast pig, which he carefully weighed and hung at the front of the restaurant. Luckily we were seated far enough away that Andrew couldn’t drool on it. If this humble meal was a sign of what was to come in Hong Kong, we were going to be very happy foodies. 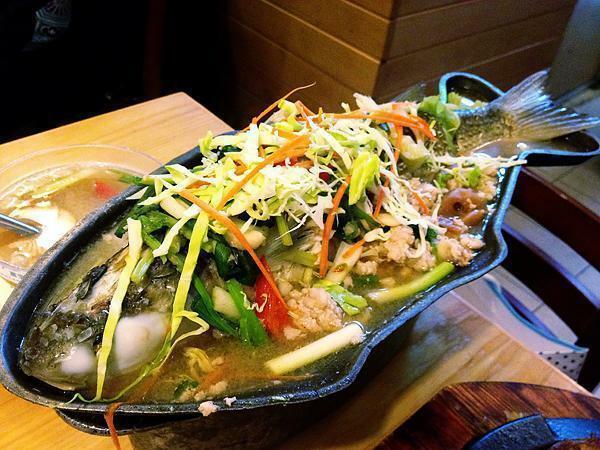 The following evening, we were searching online for a great, local place to eat, nearby. I stumbled across some rave reviews for a restaurant simply named BBQ. Canadians can never say no to a great BBQ, so off we went. We discovered BBQ had two locations, right across the street from one another. Both were packed, a good sign, and we were the only Westerners around – a great sign. We grabbed the last table, in the back corner of the smaller of the two restaurants. The menu was essentially a paper checklist, which was thoroughly confusing. Things didn’t get any easier when the waitress arrived. While her English was better than our Chinese, that’s not saying much. It also turned out that many of the items we had randomly selected were sold out. 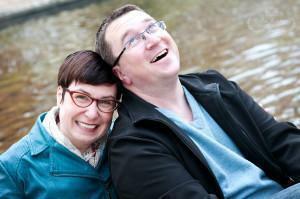 Ok, we said, “What do you suggest?” She started ticking off items on our list, and we nodded and smiled. We had no idea what was going to end up on the table, but looking around at our fellow diners’ happy faces, we didn’t care. Shortly after that, she began plonking dishes on our table – mostly items skewered on sticks. There was a parade of succulent beef, pork, chicken and giant prawns. Then the one item we were unsure of appeared – geoduck. I had seen these long, bizarre shellfish before, but had never actually eaten one. What arrived on our plates had no resemblance to the ugly sea creature it once was. The presentation was beautiful, and we dove in. The taste was tender and light; delightful! We almost let our intimidation of this little local place scare us off, but we were so glad we stuck it out. As we were leaving, the waitress haltingly asked us if we enjoyed our meal. Our beaming smiles and thumbs up certainly got our point across. 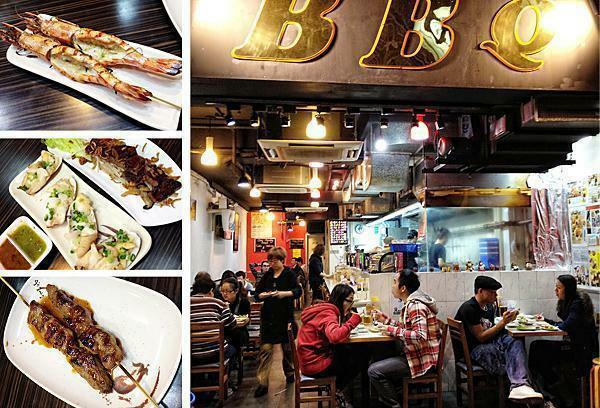 Our next foodie adventure in Hong Kong took us to the outer reaches of Kowloon, to a neighbourhood we probably wouldn’t have ended up in on our own. 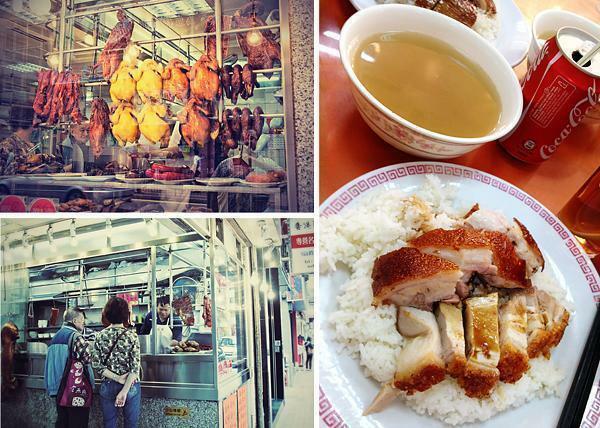 Luckily, we had the best guide to the Hong Kong food scene possible. While researching our trip, I stumbled upon the incredible Food of Hong Kong and Macau by HK Epicurus. 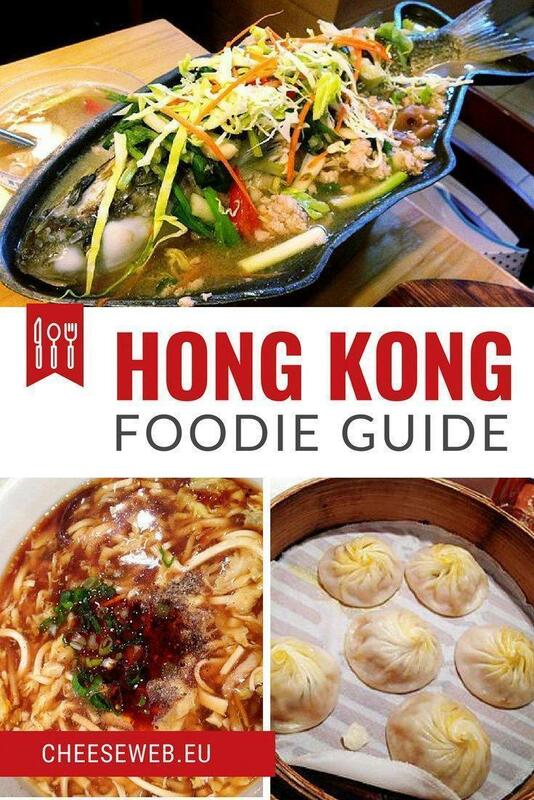 If you want to eat in Hong Kong, visit this site first. Not only is it a wealth of information, but the man behind the site is a genuinely great guy. He patiently answered my endless questions about where and what we should eat and even offered to show us around. HK met us at the metro station, and we dove into Kowloon’s bustling streets. 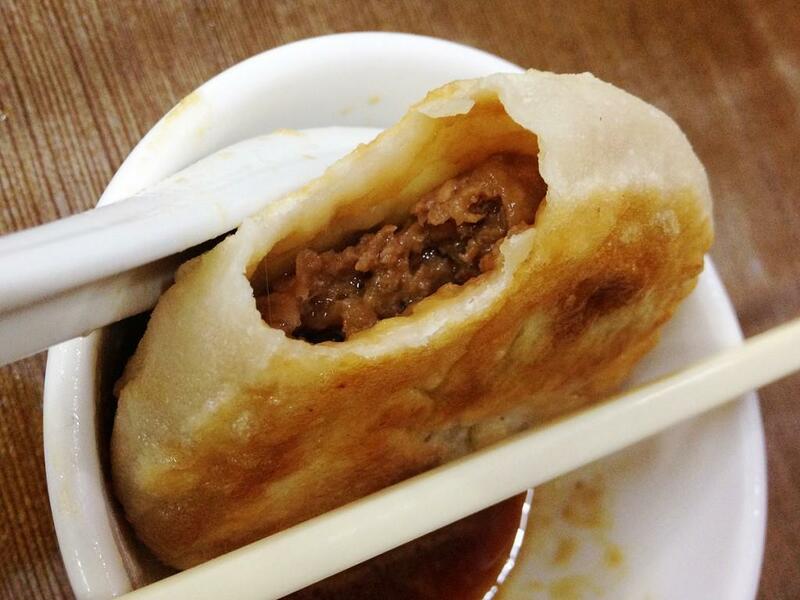 Our first stop was Islam Food, a halal restaurant with a very unusual specialty – the ‘juicy beef cake.’ We took to calling the ‘juicy beef cake’ the Hong Kong hamburger, as it is a juicy beef patty wrapped in dough. The dough is lightly fried, trapping all the juicy goodness inside, so when you bite into it, you get a juicy beef explosion in our mouth. Hot, messy and delicious! By the time we left Islam Food, Hong Kong was drenched in rain. We ducked under awnings and puddle jumped our way to Chao Phraya, a nearby Thai restaurant. 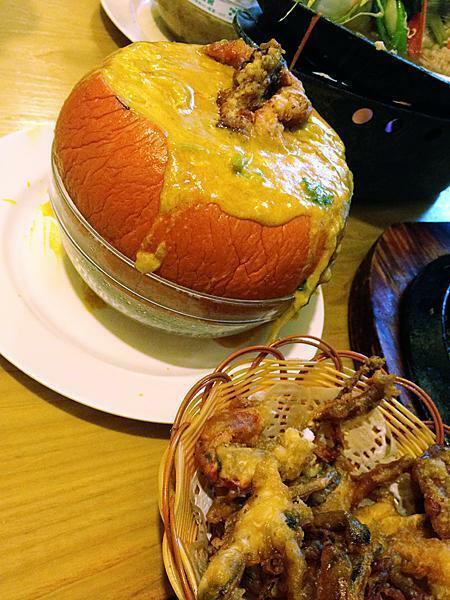 HK knew one dish we absolutely had to order, deep fried soft-shell crab and pumpkin curry. We ordered a bunch of other dishes, and all of them were great, but nothing could beat the combination of rich, sweet curry and crispy, crunchy crab. It looked and tasted spectacular. We closed the restaurant down and practically waddled to the metro station, armed with plenty of priceless foodie tips for our future meals in Hong Kong. Two notable non-Asian restaurants we enjoyed were Bacar Tapas Bar, which had a great wine list and was just steps from the Mid-Levels Escalator. By the end of our two weeks in Asia, we were both craving steak. 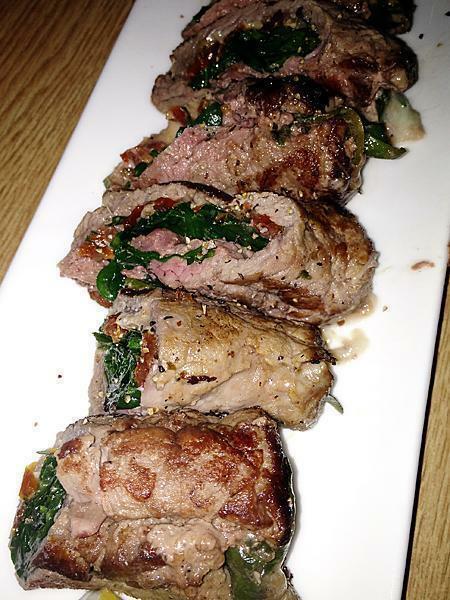 The reviews of Tango Argentinian Steakhouse sounded promising, and we weren’t let down. 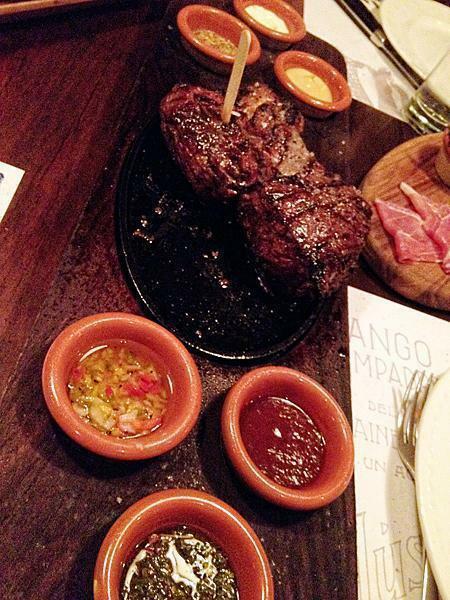 We shared the Gaucho Platter which consisted of three mammoth pieces of meat. On the side, we ordered a salad of spinach, gorgonzola cheese and walnuts and mouthwatering cheesy, garlicky potatoes. We didn’t go to Ozone for food, although it turned out the food was much better than we expected. We went for the view – and what a view it was. The Ritz Carlton’s bar, at the top of the International Commerce Centre (ICC), towers 118 floors over Hong Kong harbour. Riding the elevator to the top made our ears pop and standing at the wrap-around windows made us a little dizzy. 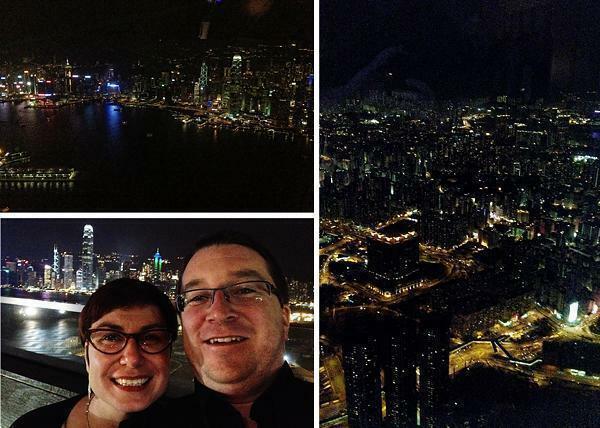 As we watched the lights of Hong Kong twinkle below us, Andrew remarked on how it reminded him of the Matrix. As you might expect, drinks with a view like this come with a hefty price tag. However the cocktail list is extensive and innovative (I loved the Piccante – Vodka, Fresh Mango, Lemongrass and Chili Foam) and the tapas are tasty. For a once in a lifetime look at Hong Kong, it was worth it. I have saved the best for last dear readers. 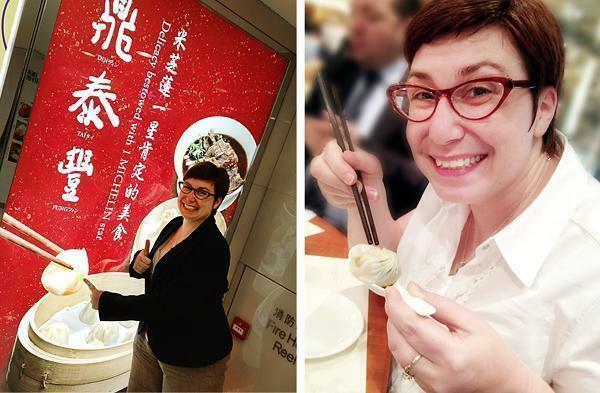 The rest of this post shall be called “Alison’s love affair with the soup dumpling.” Andrew had his pork obsession fulfilled on our first day, but I was on a mission to find something I had read about and longed for – a delicate dumpling, filled with piping hot soup, called Xiaolongbao. The great soup dumpling debate is to Hong Kong, as the best friterie or waffle shop is to Belgium. 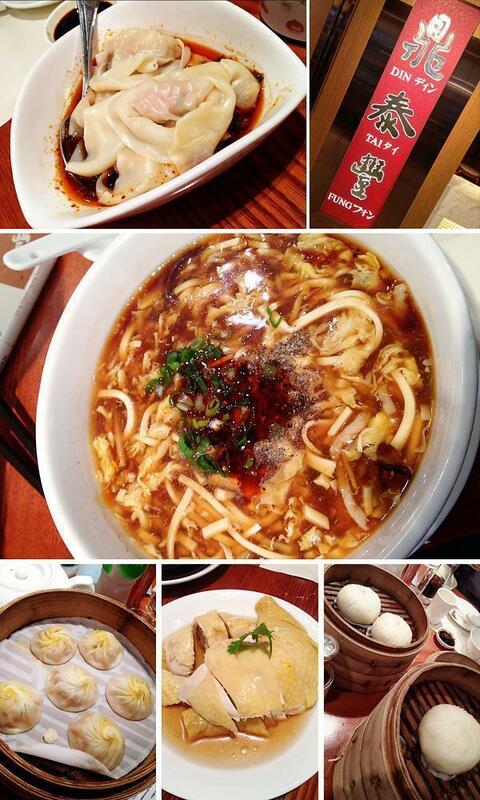 Most people agree Din Tai Fung makes an exemplary version of Xiaolongbao. We visited this restaurant, located on the top floor of a shopping mall, early on in our stay. We were with a group of six and had little idea what to expect. Perusing the menu, we saw Din Tai Fung is a Michelin Star holder, but you’d never know it from the reasonable menu prices. We each ordered a dish to share, and of course, my choice was a steamer basket of soup dumplings. When they arrived, it was love at first bite. There is a whole technique to eating Xiaolongbao. You place it in your spoon, pierce the delicate dumpling with your chopsticks, so the soup drains out, and then you pop the whole thing in your mouth. Heaven. 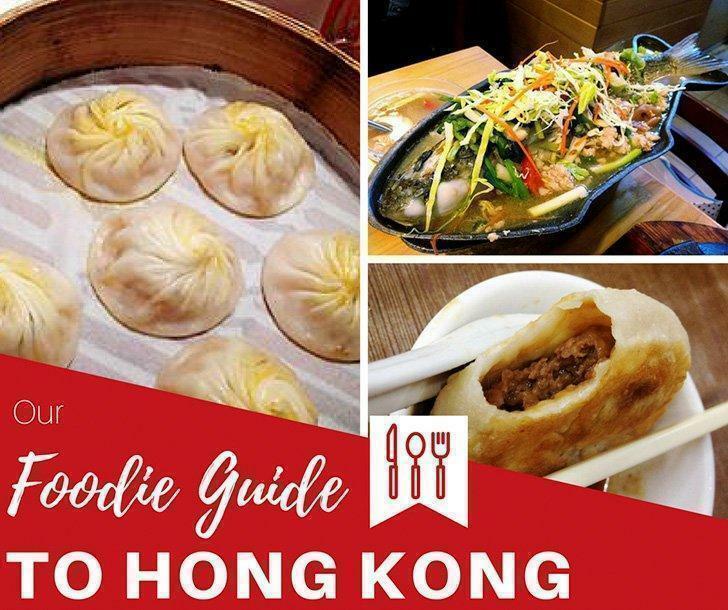 Din Tai Fung serves a variety of Xiaolongbao, and we ended up trying them all. 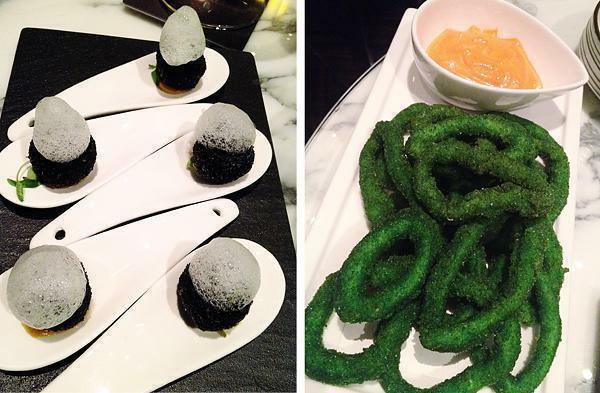 The favourite was a black truffle dumpling that was simply mind-blowing. In fact, everything we ate was so good, fluffy steamed buns, delicate dumplings, fiery noodles, drunken chicken, Andrew and I vowed to return. True to our word, the two of us queued up for a table on our last full day in Hong Kong. It may just have been even better the second time around. 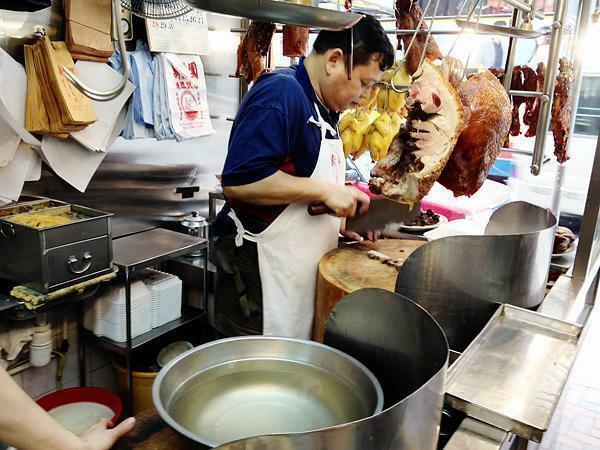 Hong Kong truly is a foodie paradise, and we’re already itching to return and explore more of the local flavours.